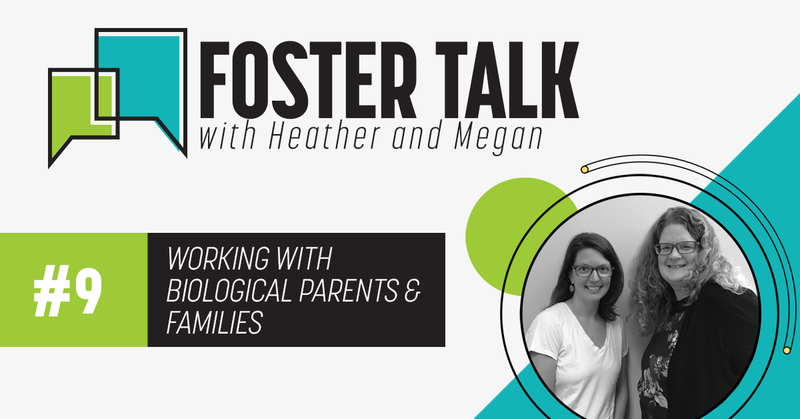 Heather and Megan tackle the delicate role that a foster families’ relationship with the biological family plays in caring for a child. I think that for foster parents one of the most challenging aspects is interacting with biological families, because you are asked to form a relationship with the person who was unable to provide appropriate care for the child who is in your home. You are often dealing with the ramifications of the biological parents’ actions — whether it be medical issues due to drug use or trauma due to maltreatment in the biological home. The courts look closely at whether the foster family is supporting reunification. This can be quite challenging especially if the biological parent has untreated drug and alcohol or mental health issues. I encourage foster families to remember that no parent wants to put their child in a situation where they need to be removed from their care for safety reasons. A biological parent may face this situation due to untreated mental health or addiction issues or their own trauma history. I try to remember that the difference between foster parents, staff and biological parents are the lack of skills, support system and untreated issues. The biological parents often do not have extended family to support them; they may have had their own childhood trauma that has not been treated; and they may not have good role models for how to parent. I have observed visits between foster children and their parents where the parents show that they care deeply for their child but do not have the skills or resiliency to overcome their life challenges so that they can parent their child. As an adoptive parent I’ve have always made sure to speak positively about my kids’ biological parents. I have been honest about their life challenges and how their addiction issues impacted my sons. I have also shared how brave they were to sign off on their rights when they were able to see how the children needed permanency and that they were not going to be able to overcome their addiction issues to get custody of their children. I have to be honest and say that I have been frustrated that I have to work to “fix” issues that I did not cause and can’t control, but I try to remember that without my own supportive family, knowledge and skills, I could have been in their situation. During trainings my husband and I were told that forming a positive relationship with our foster child’s family was important, but we were also cautioned that bio parents might resent us, be insecure around us, and maybe even criticize our ability to parent their child. And all of that advice has proven to be so accurate. Over the course of our time as foster parents, our relationships with the biological families have ranged from little to no contact, all the way to regular text conversations between visit days. As we have gained confidence as foster parents, so has our desire to communicate with biological families and parents grown. With each step we take to show respect, love, and compassion for our foster child’s parent, we have felt the tension and awkwardness slowly disappear. As with any relationship, forming a positive connection with a biological parent takes work. Sometimes our hard work pays off, sometimes it’s greeted with a lukewarm reception at best. And sometimes, quite frankly, we get exhausted by the criticism or the blank stares. But we remember that trying to always present situations respectfully, humbly, and kindly only benefits the child. I have found that sharing photos- either by text or printing them out for the parent to keep is one of the more effective ways to open communication. It gives me a chance to tell a story and shows the parent their child is safe and happy. It’s an easy (and affordable) offering of peace that shows you care, not just about their child, but for the success of their family. One of my most favorite stories wasn’t a happy ending until much later – actually a year after reunification happened, to be exact. My family and I tried visit after visit to create a relationship with our foster son’s mom and were met with polite disinterest each time. However, a year after they were reunified, I received a call from our former caseworker asking if she could share our email address with his mom and, still to this day, every few months we get an update with photos. Only now, we are the ones who get to see how happy he is and how much they are thriving together. Biological families are going through a lot when we meet them. Empathy can often be hard, too, but it’s so important for a successful foster situation. I always try to remind myself that the caseworkers are there to work on the problems, and our job as a foster parent is to care for all the people involved to the best of our ability.